Private, quintessential mountain cabin! Breathtaking, long range mountain views looking right down the heart of Maggie Valley. The home is located in Valley Vista, a gated community just minutes to town. A gentle drive up very well maintained gravel roads brings you to your private mountain getaway. 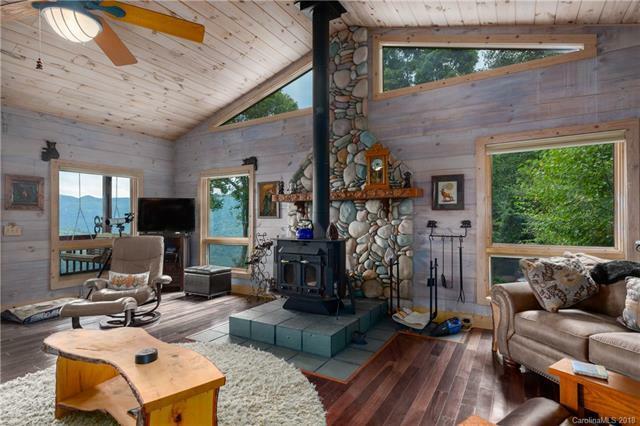 The home features vaulted ceilings, hardwood floors on the upper level, open floor plan, woodstove in the great room, a large master suite with access to the deck & views. The master bath opens to the side deck straight to the covered hot tub. You will feel like you are in a treehouse! Sparkling stainless appliances in the kitchen! The lower level offers a 2nd bedroom suite complete with bath. Additional space available for a recreation room or family room. Nice laundry area with storage. Upgrades include an instant hot water heater, central HVAC, radon mitigation, & hook up for a generator, Furnishings are negotiable. Lower lot available at bottom of the mountain for storage, garage, etc. Sold by Better Homes And Gardens Real Estate Heritage.